We are glad to announce that our news system has been improved. It will let you find the information that you are looking for quicker and easier using the new search option. You can also subscribe to our RSS Feed in order to be notified about new releases, tutorials and new. You can also comment on the articles and express your ideas and suggestions. We are constantly improving our products and we will be glad to hear and implement your ideas. This entry was posted in Miscellaneous, News and tagged Duplicate, Duplicate File Finder, Find, Find Duplicate, Find Duplicate Photos, Find Duplicate Pictures, Finder, Gallery, Image, Images, Screen, Windows on May 14, 2010 by MindGems Support. Fast Duplicate File Finder 2.5.0.1 is released packed with new features. The new enhanced Browse for Folder dialog will let you add multiple folders at once. “Remove from list groups containing single file after delete/move” option is added. “Show user checked files in different color” and “Show user checked files in bold font” are useful in order to track the files that you have checked manually. The auto Check option to check “Files with newer dates” can be used to preserve your original files. 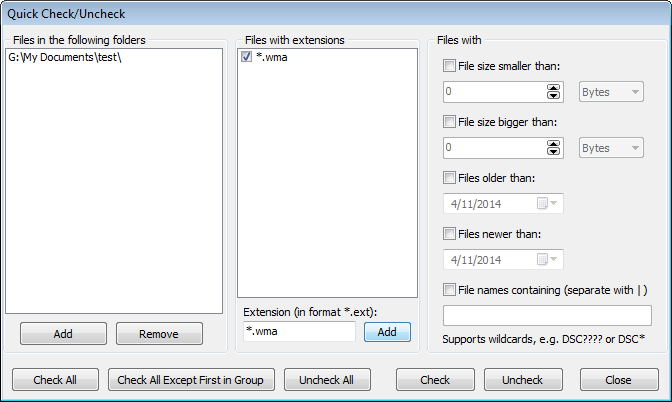 New Auto Check option to check “Files with bigger sizes” in similarity mode is also available. A handy new feature is available via popup menu in the folders list – “Disable self-Scan For This Folder”. This is useful if you want to scan two (or more) folders against each other. You can now export the duplicates list to XML or CSV file. 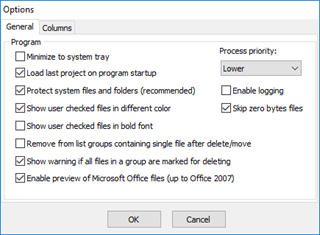 Added grid popup menu item “Check All Except Excluded” (CTRL+E) which will check all files except the excluded ones from the Advanced dialog in Auto-check options or files whose folder is excluded from auto-check. A lot of other new features and fixes are available. Please check the complete “What’s New” list below. Added new option “Show user checked files in different color”. Added new Auto Check option to check “Files with newer dates”. Added grid popup menu item “Check All Except Excluded” (CTRL+E) which will check all files except the excluded ones from the Advanced dialog in Auto-check options or files whose folder is excluded from auto-check. Added grid popup menu item “Properties” which shows windows explorer file properties window. Quick rename files using F2 or Rename grid popup menu. Left and Right arrow keys can now be used to navigate to previous/next duplicate in the big preview window. Enter and ‘C’ key checks/unchecks the duplicate in the big preview window. Added line nubmers in duplicate results grid. Fixed column sorting on all columns. There are now two separate columns for File Name and Folder. Other small GUI fixes and enhancements. This entry was posted in Fast Duplicate File Finder, News and tagged Antitwin, Cleanup, Cleanup Disk, Cleanup Duplcates, Cleanup Duplicates, Clear Duplicates, Clone Remover, Dedupe, Delete Duplicate Files, Delete Duplicates, Disk Cleanup, Double Killer, Dupless, Duplicate, Duplicate Cleanup, Duplicate Emails, Duplicate File Finder, Duplicate Files, Duplicate Files Delete, Duplicate Finder, Erase Duplicate Files, Find And Remove Duplicate Files, Find Duplicate, Find Duplicate Files, Noclone, Reasonable, Similar Files on April 26, 2010 by MindGems Support. Fast Duplicate File Finder 1.1.0.1 is packed with a new improved search algorithm. The increased speed will let you find and eares duplicate files even quicker. The improved autocheck algorithm provides more accurate file selection when you exclude folders from auto check. The new version also provides a better support fo 48 bit images and can handle a proper preview. This entry was posted in Fast Duplicate File Finder, News and tagged Delete, Delete Duplicate Files, Duplicate, Erase, Erase Duplicate Files, Files, Remove, Remove Duplicate Files, Scan on November 15, 2009 by MindGems Support. Our gift to you – our supportive users have now advanced into version 1.1.0.0. It is much faster and includes even more features. We are happy to give away this gem for free as a gift for your support during the years. The new version is the fastest available on the world wide web. We are glad to provide you again with the best tool as we have always put the focus to the quality. In addition to the speed increase the new version adds few useful features like the one for inverting the selection. The improved auto-check feature is now quicker and more precise. The results now are not bloated with zero file sized files – you can exclude them from the scan. A quick shortcut for selecting all files (CTRL+A) and inverting the checked files (CTRL+I) is also available. Fast Duplicate File Finder is now way ahead its commercial competitors available on the internet. It is much faster and includes more flexible features for auto-checking duplicates. You can download the latest free version of Fast Duplicate File Finder here. We are glad to see that our first 1.0.0.0 release was so impressive that even Zdnet.nl put it on their featured download list. Many web sites and blog owners wrote positive reviews about our new contribution. We are glad that we are able to provide this tool for free and will be glad to hear all your feedbacks and suggestions. This entry was posted in Fast Duplicate File Finder, News and tagged Delte, Dupless, Duplicate, Duplicate File Fin, Duplicate File Finder, Duplicate Finder, Files, Find, Find Duplicates, Find Similar Files, Free, Images, Noclone, Scan on February 16, 2009 by MindGems Support. Visual Similarity Duplicate Image Finder 2.6.0.2 improves performance with extra 10-15% at the image comparing stage and fixes a bunch of issues. VSDIF also improves multi language OS support and now handles properly the file names containing characters from the current “Language for non-Unicode programs”. The RAW processing feature is also improved and a fix for previewing 32-bit and 48-bit images is added. Corporate version now doesn’t show main window after command-line scan. Some small fixes and changes are applied including floating point operation error on some white images. This entry was posted in News, Visual Similarity Duplicate Image Finder and tagged Duplicate, Duplicate Images Raw Format, Duplicate Raw Image, Find, Find Duplicate Raw, Find Similar RAW, Images, Locate, Photographs, Pictures, Raw, RAW Duplicate Images, RAW Image Duplicate Finder, Scan, Search, Similar, Visual on December 29, 2008 by MindGems Support.